In autumn 2018, Masterlift Forklifts in Oakville had the idea to make a 2019 print calendar. They did this as a thank-you present that they could distribute as a Holiday Gift to their best clients who would, it was hoped, then display and use in their Shipping & Receiving departments. This would exhibit Masterlift for their whole world to see and come to know as the best local forklift rentals sales and service company in Canada. Masterlift reckoned that people at work in truck loading bays would like to see the forklift equipment they know best being operated by attractive females wearing fashionable clothes. The idea that pretty girls could spend the days as well-dressed shift workers being productive in dirty places driving Masterlift Forklifts was curiously intriguing to them, and they hoped their clients would find it equally compelling. The 2019 Masterlift Print Calendar is filled with female forklift operators made to look fantastic with proper lighting, makeup and fashion. The Art Director’s idea was to showcase feminine subjects in masculine settings and try to capture something she calls ‘curious beauty’. She styled their clothes, picking the best pieces from what they each brought to the shoots. Making a workplace fashion “lookbook” by styling their own clothes was one of the biggest challenges. Because they were making a print calendar, they had to prepare at least one picture for every month of the year, and each model’s clothing had to reflect the season. Additionally, the Art Director asked Masterlift’s own rentals and service clients if she could shoot pictures at their job sites to demonstrate the diversity of the forklift rental company’s clientele. These locations also had to be dressed, with other branding removed or eclipsed, and in some cases professional lighting was required to get good looks in dark spaces. But in the beginning the team had no clear idea of how many locations they could get, and whether these would have interior or exterior elements. So the first shoot was Summer, and the rest were left to fall where they may. Feast your eyes on Shannon Tebb from Shanny in the City, a personal matchmaker in Toronto. She was one of the three models that the company photographed on that first Thursday in September. They got lucky as the weather on that autumn morning was hot and warm and they could get the calendar’s summer shots. Shanny is seen in this picture posing at Rosehill Wine Cellars in Etobicoke, Ontario. At this location the forklift moves wood and the lighting was the sun pouring in through the open loading bay door. Shanny has a polyester blend white floral pattern blouse and ripped jean shorts. She had cute little work boots and yellow hard hat too. Unlike other fashion shoots were the model is silent, Shannon blogged about being a Masterlift Forklift model on her own blog where she documented her role in the production and was kind enough to show the world images of herself selecting the free wine cellar accessories that Rosehill bequeathed to her as gifts that morning. Spirits ran high the day Raymi Lauren visited Maverick Distillery in Mississauga. There is nobody quite like Raymi Lauren who is Raymi the Minx, another Toronto blogger and fashionista that posed for the Masterlift 2019 print calendar wearing a pink satin dress. She was photographed at Maverick Distillery which makes TAG vodka, and I suppose this why the Art Director selected evening wear. The forklift operator’s costumes were always just on the edge of what’s possible, that is to say, it is possible someone could go to work wearing a satin evening dress, but only if they worked in a vodka distillery. Here is Erin working on the Masterlift brand forklift at Approved Cold Storage in Burlington. This refrigerated freight warehouse requires winter clothing be worn at all times; brr its cold in there. The Art Director selected this attire from the clothes she brought and it was very similar to what the other workers were wearing – warm pants, winter coats and hats. In many of these images you can see the photographer, Joel Levy at work. Joel is also the editor of Toronto Guardian magazine and in his capacity as a local news gatherer he has developed a terrific interior photography style. In these shots he mostly used a separate flash on a tripod to light the subjects two-stops over exposed and then he under-exposes the shots overall in the camera by a couple fstops so the picture ends up having nice contrast; there are rich blacks in the corners but the model is perfectly exposed. See below how flat the space looks in the normal fluorescent overhead lighting. Joel’s photography style gives these flat spaces more dimension. 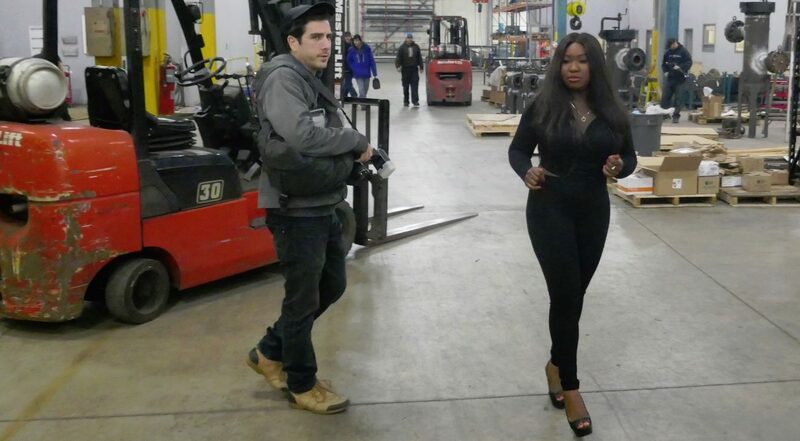 Below is Stella Adewolu who is a paralegal with real style and she was photographed on the shop floor of Islip Filters which is an oil and gas pipe filter manufacturing plant in Oakville. She was dressed in a black spandex style jumper a low-cut front and she looked gorgeous in the red forklift against the yellow duct curtains in the facility. Below is Laura Bilotta from Single in the City at Dan’s Welding in Burlington, and this was a terrific shoot that had lots of natural excitement with people welding in the background. Laura wore a gorgeous fur shawl with black jeans and a low cut top. Her gold and silvery jewelry also stood out in these photos. This was where the Art Director threw away reality and went full fantasy. The model had a great time and Laura Bilotta blogged about being a forklift model on her dating and relationship advice blog on her Single’s Matchmaking website. The post displays off some of the best pictures and details other parts of the welding plant. Would you like a copy of the 2019 Masterlift Forklift Calendar?